TOKYO- In a move that is sending ripples throughout the gaming community, Shuhei Yoshida announced today that Sony will be abandoning the Vita and making a PlayStation app for 3DS. 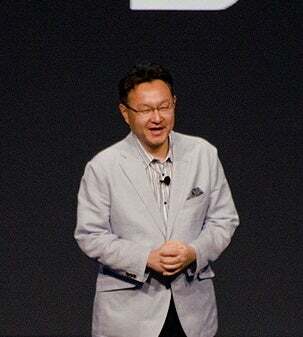 At a press event called “The PS Future Xperience”, a noticeably solemn president Yoshida announced that Sony was discontinuing the Vita indefinitely. Citing an abysmal lack of sales, and inability to “entice 1st, 2nd, even 3rd party developers” into “devlop[ing] real games” for the handheld, Yoshida called the handheld’s minor sales a “joke” and said, “[PlayStation ‘father’ Ken] Kutaragi would be spinning in his grave over such a disgrace as [Vita].” He quickly added, “If he were dead”, seemingly after remembering Mr. Kutaragi was, in fact, still alive. Mr. Yoshida then left abruptly, mumbling about Zoloft, as the massive screen showed trailers for some exciting upcoming titles for PS4. No Man’s Sky is still looking great! No new footage of Uncharted 4 or The Last Guardian, but we saw what looked to be real gameplay from Street Fighter 5! The president retook the stage after the sizzle real to announce a new joint plan with Nintendo. Apparently, the newer models of 3DS and 2DS will be able to download a PlayStation App. The app will host several titles to purchase from PS1, PSP, and Vita- though it is unknown at this time what those are. The app will also have full access to the streaming service PlayStation Now.